Many of the videos that you download from video hosting sites like Youtube these days are saved as flv files on your computer (check out our Download Youtube Videos guide for tools to download videos from the popular video hosting site). And while you have plenty of programs at your disposal to watch them directly there (VLC and SMplayer are two), you may not be as lucky if you want to watch them on the big screen instead. That’s when you may realize that your video DVD burning software is not supporting flv files, or that it is not enough to burn the flv files to disc in hope that your hardware media player supports the format. Sometimes, the only option is to convert flv files into a different format.FLV Converter is one of the programs that can do that. The software is available for the Windows operating system, and provided as a portable version and installer. When you open the program you will immediately notice that it is minimalistic by design. Click on Add Video to add the flv videos that you want to convert. You can later on remove them again from the video file listing. 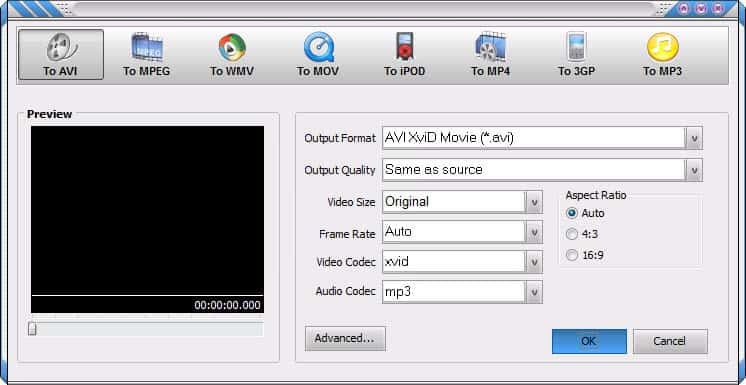 The flv converter displays a conversion dialog for every video that you add. Here you can select the destination format for the video file, with formats such as avi, mpeg, mp4 or mp3 supported. You can keep the suggested conversion parameters, or modify them to your liking. Here it is for instance possible to change the frame rate, output quality or video codec used. The advanced button lists additional parameters, from adjusting the audio volume to selecting specific video and audio bitrate qualities. A click on convert in the main interface starts the conversion. The output folder is displayed in the footer area in the main interface. You cannot add new videos once you have started the process. You can however preview the video that is currently converted. The program can be useful for users who need to convert flv videos into a different video format. It is not optimized for batch processing though, as it does not seem possible to set a default output video format to skip that configuration step. This entry was posted in Uncategorized by Martin Brinkmann. Bookmark the permalink.